The Spring 2018 Loyola Club Luncheon will be held on Thursday, April 19, 2018, from 11:30 AM to 1:30 PM. 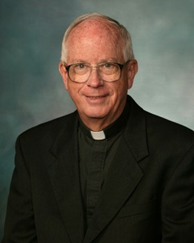 We are pleased to welcome Fr. George Winzenburg, SJ, President of Red Cloud Indian School, as our speaker. The luncheon will be held at the University Club of Washington, DC (1135 16th St. NW, Washington, DC). Fr. Winzenburg has been president of Red Cloud Indian School and an ex officio member of the Board of Directors since 2010. He earned a Bachelor’s degree in History from Spring Hill College in Mobile, AL, a Master’s degree in Counselor Education from Boston University, and a Master’s degree in Divinity from Weston School of Theology in Cambridge, MA. Before coming to RCIS Fr. Winzenburg held a number of leadership roles in Milwaukee: director of campus ministry at Marquette University, president of Marquette University High School, and pastor of Gesu Church. He moved to South Dakota in 2002 and was, until 2010, the director of the Sioux Spiritual Center and of the Ministry Formation Program for the Diocese of Rapid City. « Register Today for Our Winter Luncheon on Feb. 8, 2018!